Recently, I found myself caught in Park Ave traffic behind a car adorned with an obnoxiously large Ohio State Buckeyes magnet. With merely a glimpse of it, my pulse quickened and my palms tightly gripped the steering wheel. As an ardent Nittany Lions fan, I recoiled at the unwelcome reminder of our rival. And there it was, that loaded term. A lot of ink, real and virtual, has been spilled debating what defines a genuine “rivalry” in college football. Because we have imbued the term with a certain sacred quality, participation in a recognized rivalry is its own form of cultural currency. Fans even seek to insult one another by denying that they consider an opposing school their “rival.” So what makes a rivalry? When your new coach gives his introductory press conference, a rival is the team against whom he goes out of his way to promise wins (the lack of such most likely contributed to the recent job opening). When Jim Tressel arrived at Ohio State, he guaranteed wins against Michigan. Urban Meyer did the same. A couple years later, Jim Harbaugh returned the favor. In the ESPN documentary Trojan War, about the powerhouse USC teams of the early 2000’s, a newly-arrived Pete Carroll is shown listing his top priority for rebuilding the program: Beat UCLA. Rivals face off on a regular basis; they play meaningful games at key points in the year. Rivals ruin each other’s seasons. Rivalries develop over time, organically; they thrive on geographic proximity (familiarity breeds contempt). They get nicknames, like the Civil War, the Apple Cup, the Red River Shootout, and the Iron Bowl. Speaking of which, sometimes great rivalries get a little out of hand. And so I got to thinking, “Would a Penn State magnet in Buckeye country elicit a comparably visceral reaction?” When we classify Ohio State as a rival, do their fans reciprocate? Probably not. They’re still settling scores from the War for Toledo. Once upon a time, such a question would never be asked. Between 1896 and 1993, Penn State played 96 times, their Thanksgiving weekend clash resonating with media and fans nationwide. We got a glimpse of that again when the two teams staged their epic prize fight last month, the first of four meetings scheduled out until 2019. Pitt-Penn State was once a rivalry, and perhaps it can be again (here’s hoping). But at best, this latest renewal looks like no more than a fleeting echo of the past. The series is set to expire with no sign of further renewal on the horizon. The changing landscape of the sport conspires against it. True gridiron animus needs to flow through regularly-scheduled antagonism. The Lions still lack that one special somebody to clash with year-in and year-out in games of consequence. In the modern era, such consistency can only be found within your school’s athletic conference. So what about Wisconsin? The Badgers, really? Stay with me here. It could have happened, and here’s how it almost did. In 1993, Penn State completed its historic transition from football independence and began competing in the Big Ten. The Nittany Lions arrived bearing one of the sport’s great brand names, an asset that carried surprisingly little cache in a discriminating club with a century’s worth of tradition whose members had embraced the change with obvious reluctance. Most Big Ten teams had been facing off since the Depression, and Penn State was the new kid in the old neighborhood. The fit was (some would say “is”) awkward at times. 1995 – In their first conference meeting, Alvarez and the Badgers humbled the sixth-ranked defending conference champions with a 17-9 win at Beaver Stadium. 1996-97 – Two of the nation’s best runners, Curtis Enis of Penn State and Wisconsin’s Ron Dayne, faced off in two slugfests won by the Nittany Lions. 1998 – With Enis gone to the NFL, Dayne got his revenge, leading the Badgers to a 24-3 win. 2001 – A somber pall hung over the proceedings in the first week of games after 9/11, and an 18-6 victory for the Badgers denied Joe Paterno a chance to tie Bear Bryant’s all-time wins record in front of the home crowd. 2002 – Penn State scored a hard-fought 34-31 victory at Camp Randall Stadium, highlighted by four field goals from Robbie Gould. 2004 – Quarterbacks Zack Mills and Michael Robinson were knocked out of the game with injuries while Wisconsin fullback Matt Bernstein, fasting for Yom Kippur and running only on IV liquids, gutted the Lions’ defense for 123 rushing yards in a 16-3 win. 2005 – The last meeting between Barry Alvarez and Joe Paterno, a contest for sole possession of first place in the Big Ten, became a Senior Day to remember for the likes of Michael Robinson and Tamba Hali, who helped advance Penn State’s incredible comeback season with a 35-14 victory. 2006 – Wisconsin won 13-3, and new coach Bret Bielema earned the enmity of Penn State coaches, players, and fans by abusing a short-lived kick off rule to run out the first-half clock. Both events were obscured by a sideline collision that sent Joe Paterno to the hospital with a broken leg. 2007 – Unranked Penn State again reclaimed bragging rights in the series by pasting the #19 Badgers 38-7 in Happy Valley. 2008 – Derrick Williams took a punt to the house; Aaron Maybin burst onto the scene, and Daryll Clark created an iconic image. Badgers fans probably just wanted it to end, as Penn State grabbed the national spotlight with a 48-7 road win in prime time. 2011 – Battered and reeling from the Sandusky scandal firestorm, Penn State traveled to Madison playing for a berth in the inaugural Big Ten championship game. Russel Wilson and Co. claimed that spot decisively, winning 45-7. 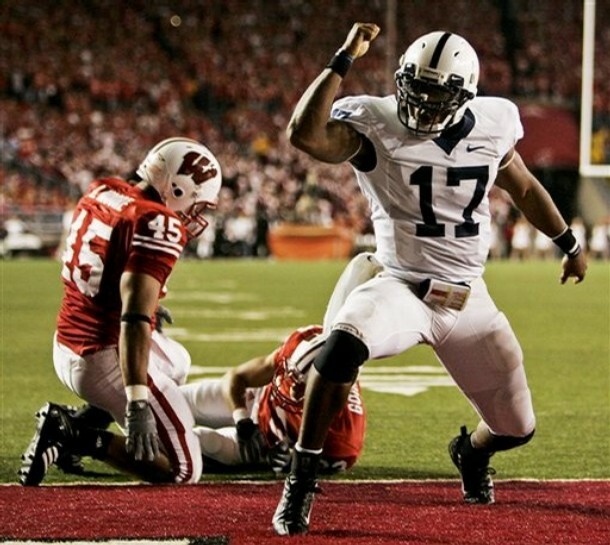 2012 – Badgers tailback Montee Ball set the FBS career touchdown record, but the Nittany Lions won the day. Emotions ran high as one of Old State’s greatest teams honored injured leader Michael Mauti by wearing his number 42 on their helmets and leaving their hearts on the field. When a Wisconsin field goal attempt fell short in overtime, embattled sophomore Sam Ficken’s successful try from the previous series became the winning points in one of the most memorable victories in program history. 2013 – O’Brien’s Lions walked into Madison as 24-point underdogs; they left with a 31-24 win that derailed Wisconsin’s hopes for a BCS bowl. The stunning upset, which brought the all-time series to 8-9 in favor of Wisconsin, also saw Penn State equal the series’ longest winning streak – two games (if you don’t count the Badgers’ three-game “streak” carried over from the early 1950’s to their ’95 win). The pattern was established. Penn State and Wisconsin, Big Ten party crashers both, would close out against one another, with bowl berths, and potentially division titles, on the line; already in the short series history, each had handed humbling losses to the other. That scheduling move to end each year’s campaign with the Penn State-Wisconsin game was the key to shifting the matchup from proto-rivalry to genuine article. Virtually all of my key ingredients for a bona fide, both-fanbases-agree, referenced-as-such-on-GameDay college football RIVALRY were there: regular meetings, consequential outcomes that cut both ways, bad blood that develops over time. Yes, proximity worked against it, but in the coming age of the “super conference,” rivals will increasingly be found as close as the nearest airport. The Nittany Lions and Badgers were just on the cusp of playing an often meaningful, usually unpredictable, and gloriously contentious annual capper to their regular seasons. Both were perhaps only a few more meetings away from finally finding a year-in, year-out rival they could both love to hate. It was that close. For a few fleeting moments, all of this was possible, and then, like so many things in life, it was ruined by Rutgers and Maryland.